I arrived in Hawaii in mid-August to assume my new role as the permanent CEO of Wahiawa General Hospital, and almost immediately, it felt like home. I could hardly wait to join our committed staff, caregivers and physicians in caring for the health needs of our community. 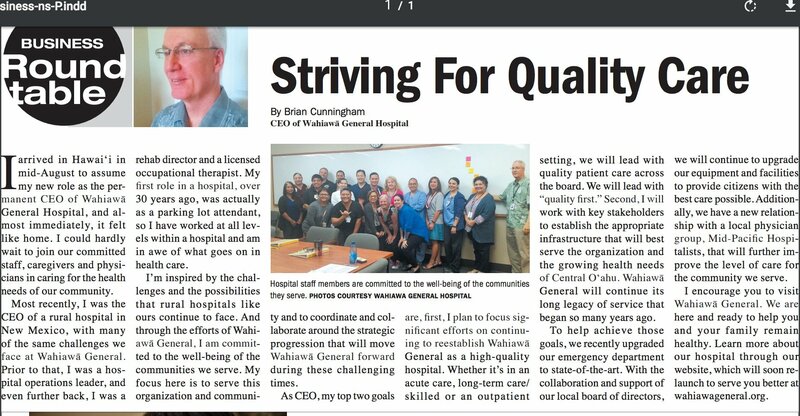 Most recently, I was the CEO of a rural hospital in New Mexico, with many of the same challenges we face at Wahiawa General. Previous to that I was a Hospital Operations leader, and even further back, I was a Rehab Director and a Licensed Occupational Therapist. My first role in a hospital, over 30 years ago, was actually as a Parking Lot Attendant, so I have worked at all levels within a hospital and am in awe of what goes on in healthcare. Download and read the full article in MidWeek’s Business Roundtable, Oct. 25, 2017.